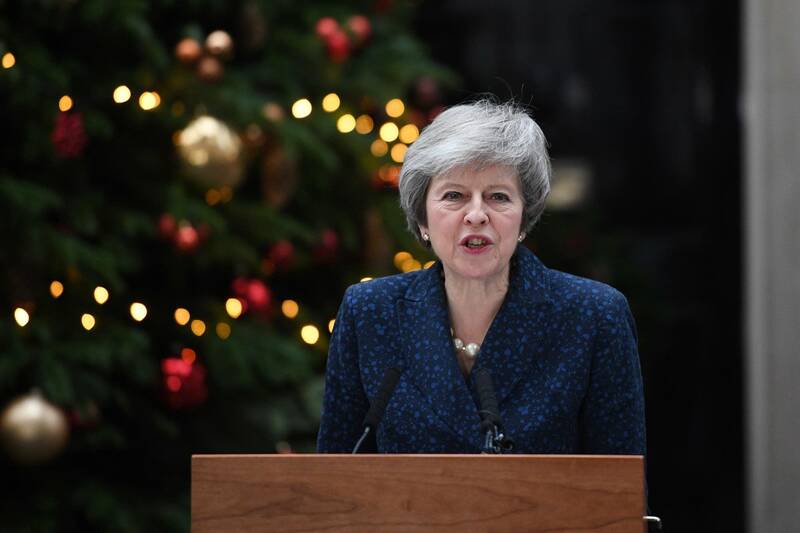 Updated: 3:33 p.m. | Posted: 1:51 p.m.
With the U.K. fast approaching the March 29 deadline for when it will leave the European Union, the prospects for an orderly, on-time Brexit -- or even any Brexit at all -- have dimmed considerably. On Tuesday evening, British lawmakers rejected the deal Prime Minister Theresa May had reached with the EU, opening a Pandora's box of possible outcomes to be considered in the weeks to come. Just 202 members of Parliament sided with May's plan, while 432 cast votes to kill the proposal. It was the biggest defeat for a British government in Parliament in modern times. If the Labour leader succeeds with his no-confidence vote, he might then be able to force May's resignation and trigger a general election to oust Conservatives from power, though at the moment that appears unlikely. Tuesday's result isn't much of a surprise, coming five weeks after May had to postpone the original scheduled vote to shore up support for her deal. It does, however, raise a series of difficult questions for the U.K. in the shadow of that March deadline - chief among them: What happens next? One remote possibility is that May's own Cabinet may turn against her, telling the prime minister that they have lost confidence in her leadership and that she should step down. A number of her Cabinet ministers have already decided to step down in protest of her plan, and Conservative whip Gareth Johnson tendered his resignation on the eve of the vote. But if, as seems more likely, May soldiers on, then the next step is relatively clear: "The Parliament has given Prime Minister May three [working] days to come back with a Plan B," NPR's Frank Langfitt explained. "She may go to Brussels on Wednesday to try to get more concessions on the deal. But people are skeptical that she's going to get anything that's going to win over members even of her own party." 1. The U.K. faces the March 29 deadline to leave the EU without any deal in place. The prospect of a "no-deal Brexit," while cheered by some hard-liners, has spooked many others -- including Rod McKenzie of the Road Haulage Association, which represents half the U.K.'s truckers. "The potential is pretty scary," he told Langfitt, saying customs checks may make transport a nightmare. "We could see 20 or 30 miles of lorry traffic queuing towards Dover, which is the No. 1 port with the continent." 2. Parliament seeks to extend the deadline for departure and renegotiate the Brexit deal in a way that is more palatable to lawmakers. May has ruled out such an extension, but the EU is already reportedly preparing for the possibility of a months-long Brexit delay. And the bloc's highest court has ruled that it's OK for the U.K. to unilaterally reverse its decision to leave. That said, EU leaders maintain that renegotiating the deal itself is off the table. 3. The last option is a prospect that, even a couple of months ago, might have seemed impossible: Go back to the British people with a second referendum. "It would be completely extraordinary. It would basically be saying, 'We can't work this out. We know you voted for it, but try again,' " Langfitt observed Tuesday. "That is an extraordinary thing for a democracy to do." Whatever may come next, any plan that involves leaving the EU will need to cut through the Gordian knot that is Northern Ireland. A roughly 20-year-old peace accord keeps the border open between the Republic of Ireland, which is an EU member, and Northern Ireland, which is part of the U.K. But that's a problem if the EU and U.K. are to separate. And the prime minister's "backstop" solution -- temporarily keeping Northern Ireland in the EU customs union as both sides figure out a long-term arrangement -- proved to be a key deal breaker for critics of May's agreement. On Monday, May and her counterparts in the EU sought to assuage some of these concerns. In an open letter addressed to the prime minister, European Council President Donald Tusk and European Commission President Jean-Claude Juncker committed to making sure "that the backstop will not need to be triggered." "Were the backstop to enter into force in whole or in part, it is intended to apply only temporarily, unless and until it is superseded by a subsequent agreement," Tusk and Juncker added, pledging the "necessary political impetus and resources" to quickly reach that more permanent agreement. Still, such pledges failed to placate the deal's many skeptics, who said the letter fell short of the legally binding changes to the draft text that they had been seeking. Now, barring a miraculous last-minute renegotiation, May's deal and the backstop it included are dead. Only time will tell what will replace them -- and that window of time, as British lawmakers well know, is quickly closing.